Town attacker James Collins is guarding against complacency despite his side extending their lead over the chasing pack last weekend. Portsmouth's draw at Plymouth means the Hatters moved nine points in front of their south coast rivals, while Sunderland also dropped points, held 1-1 by Oxford. The Black Cats couldn’t significantly reduce the gap in midweek either, as they drew 1-1 with Blackpool at the Stadium of light, and were then held 2-2 by Accrington last night, ensuring they trail Luton by nine points, having played a game less. Speaking after scoring his 19th of the season in a 3-0 triumph over Wycombe Wanderers on Saturday, Collins said: “A few results went well for us, but we’re not going to get complacent. “We know Sunderland have still got a few games in hand and we’d rather have the points on the board, 100 per cent, but we’re not getting ahead of ourselves. Fellow forward Jason Cummings is also targeting finishing in the top two this year, saying: “That’s what we want, we want to go up automatically. 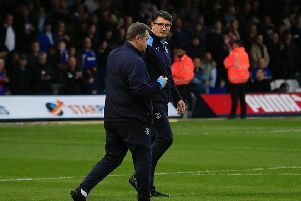 Town chief Mick Harford, who was named as manager until the end of the season this week, was more interested in his side maintaining their level of performance during the final 14 games of the season. He said: “All I and we can concentrate on as a club and a team, and I say to the players, we’ve just got to look after ourselves. “We’ve just got to do the way we want to play, the way we want to work, and if we keep putting performances in like that we will get results. Town will be cheered on by another 1,000 away fans at Fleetwood on Saturday, after 10,000 were present at Kenilworth last weekend. Harford knows just what part the Town fans are playing, adding: “I keep saying it, but they do help us. “They do help us get through these games because they are tricky games, tough games and their support is immense. "The backing at home and away from home, they’re just immense and they deserve a massive pat on the back, from myself, the club and all the players, we just thank them. "They’re immense and they really do help the team."